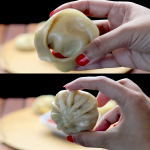 In this recipe I will tell you how to make veg momo or dumpling. 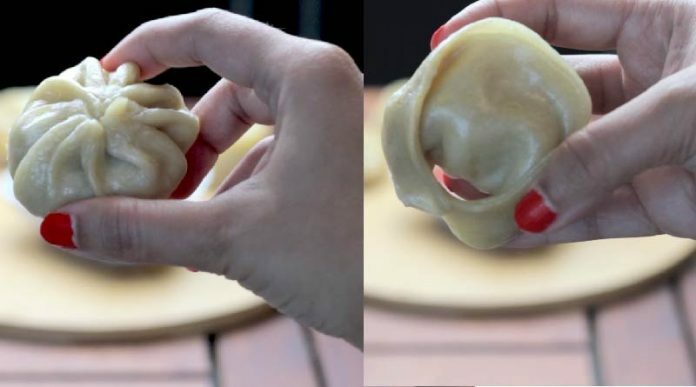 Momo or dumpling is eaten mostly in north east part of India. But now you can find momo everywhere. Its even a very popular dish in Nepal. When I was visiting Georgia, I discovered that they also make something of that sort. In Georgia they call it Khinkali. It was really yummy and juicy. You even don’t need a chutney to eat it with. I will definitely learn how to make khinkali soon as it was delicious. 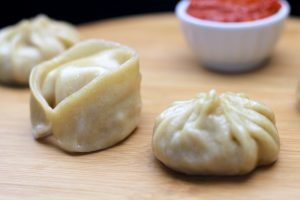 About the filling of momo or dumpling, you can use vegetables or meat. In this recipe I have used vegetables to make momo since veg momo. In India, the best momo or dumpling I ever had is served in street of Delhi. The most special thing about it is the chutney. It’s super yummy that I had to search and read a lot about how to make momo chutney. After several attempts I finally got the exact taste of that chutney served in Delhi. 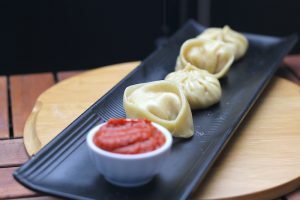 Hope you like this recipe of momo or dumpling and also how to make tasty momo chutney. Do not forget to leave your comments and share this recipe with your family and friends. Heat oil in a pan. Add ginger, garlic and green chillies to it. Fry it. Add soy sauce and mix. Turn off the gas. Let it cool. Take all purpose flour/maida in a bowl, add salt to it. Add oil in it and mix. Add water and knead a little hard dough. Now take a very small portion of dough and roll it thin using a rolling pin. Sprinkle some flour while rolling, if required. Turn on the steamer and steam momos for 10 minutes on high. Add garlic cloves and soaked red chillies (soak dry red chillies in hot water for 30 minutes) in a grinder. Grind and make a smooth paste. Heat a pan and add oil in it. Add chilli-garlic paste in it. Add tomato puree in it. Mix and cook for a minute. Add salt and vinegar to it. Mix well. Turn off the gas and let it cool. 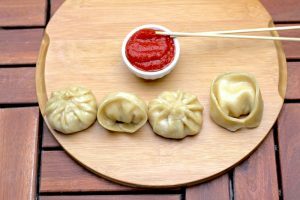 Serve momos hot with chutney. BON APPETITE!